How can you enforce the law if you do not smoke? 1.- The smoke-free law is more reason to go to hospitality industry businesses more frequently. We encourage you to do everything you can to enjoy the smoke-free law. - If the head of the establishment does not do anything about it, ask for a complaint form where you can record the violation. You can also access our website where you can fill out the complaint form and send it to the correct place. Do not let yourself be a passive smoker. Actively claim your air and your health and do not allow any breach of the new law. Since January 2, 2011, 257 million Europeans interact with each other, eat in restaurants, and have fun in smoke-free bars and nightclubs. 1.- A smoker inhales only 15% of the total smoke produced his cigar. The remaining 85% goes to the atmosphere you breathe. 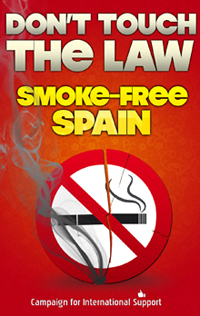 4.- In Spain, more than 3,200 non-smokers die each year, because of diseases caused by breathing polluted smoke indoors. MORE PEOPLE DIE LIKE THIS THAN IN TRAFFIC ACCIDENTS. 6.- Secondhand smoke doesn’t only give you itchy eyes and make you smell when you go home. Breathing smoke in hospitality businesses is above all a TOXIC GAS that damages your health and the health of those around you.YOU CAN WASH YOUR CLOTHES CLEAN, BUT YOU CANNOT UNDO THE DAMAGE THAT THE SMOKE DOES TO YOUR HEALTH. Join all of the people who understand that individual and social health is a fundamental human value.